This past Friday, the Republican candidate for the special election to fill the vacancy, in the 18th Representative District, Eileen O’Shaughnessy-Coleman, was kind enough to take time out, of what is obviously a busy schedule, to talk with me in a phone interview which lasted close to an hour. I have posted Mrs. O’Shaughnessy- Coleman’s résumé in a previous post. However, I do feel it is worth pointing out again. Mrs. O’Shaughnessy- Coleman is a life-long resident of the Newark area, and has lived within the 18th Dist. for twenty-four years. She is married to her husband of twenty-nine years, John Coleman. She is the mother of five. She is a graduate of John Dickinson High School, she received a BAS in Communications from the University of Delaware in 1986. It appears that while obtaining that degree, she was also the manager of Progressive Pool Management from 1980-86. Once she graduated from U of D, she worked with Citicorp from 1987-92 in Overseas Investments. She obviously has a volunteer’s heart, her philanthropic endeavors include being an Autism advocate, now this is not hard to understand considering, two of her five children are challenged by Autism. In speaking with her, it becomes clear that issues of Autism specifically, but children with special needs in general, is extremely important to her. It is also clear that she has a great deal of interest in education issues. She stated that her family made the decision to keep their Autistic children at home, and to make the sacrifices that involves, so as to give the children the best care possible. She believes there is room to improve how educational systems handle the special needs of all children. She has also been a volunteer within her community with the following organizations. This brings us to the political aspect of Mrs. O’Shaughnessy- Coleman’s life. One might expect that a person who decides to run for elected office would have been setting up that run for many years. You know the type. They start out as an intern for some politician, which by the way Mrs. O’Shaughnessy- Coleman’s did, in her senior year of college for then Governor Mike Castle. You would expect that they would stay engaged in politics at every level, either working for elected officials, or a party committee. That is not the case with Mrs. O’Shaughnessy- Coleman, it seems that after that internship for Gov. Castle, she went on with her life of building and raising a family, though she did work on two candidate campaigns as a what? That’s right, as a volunteer. 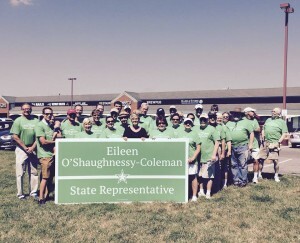 So what brings Mrs. O’Shaughnessy- Coleman to run for the 18th Representative District? Does she need something to fill her days of nothing to do? Well that doesn’t seem to be the case. Does she need the money? Well, while I didn’t ask that question, I’m going to guess no. Could it be her ego, does she need the recognition, the title? Well in my short conversation with her, I found her to be polite, intelligent, open and unassuming. So again, I will give ego a no. In my conversation with her, I felt I was talking with someone who is a member of the community, who feels elected officials should have that volunteer heart. In my view that is exactly what the people of the 18th Dist. will have as their representative if she is elected. Someone who feels the state may be headed in the wrong direction, and when asked the question who will change it, she has answered, “I will”. In our conversation I asked a number of specific questions about recent legislation that has passed, and some, that many feel will be coming in the next session. There is no need to go into specifics here, because I didn’t want the interview to be seen as a litmus test, since after all, I can’t vote for her. I will tell you that in all honesty, I have to say that she is a little behind the curve on specific bills and issues. That being said, she related that she is spending every free moment out in the community, knocking doors and talking to the people of her district. She is looking for what is important to them, not what may be important to me way down in Sussex County. What she is finding, is that education, crime prevention, jobs, and the economy are at the top of the list. I get a sense that Mrs. O’Shaughnessy- Coleman will be the type, if elected, of Legislator, who has an open mind, and is always listening to her constituents. I found her to be intelligent enough to learn, and grow, that she will come to the job with no preconceived ideas about the job or the issues. She was void of the usual talking points and one-liners that are often the stock in trade of politicians. In other words, I found Mrs. O’Shaughnessy- Coleman to be anything but a politicians. I found her to be someone ready to step up and take on another tough job, just the latest in her life. If you go back and look at the photo at the top of the page, you will see a group of volunteers, out helping the volunteer, this was a group of people, many from around the state, who came together to help door knock on Saturday. 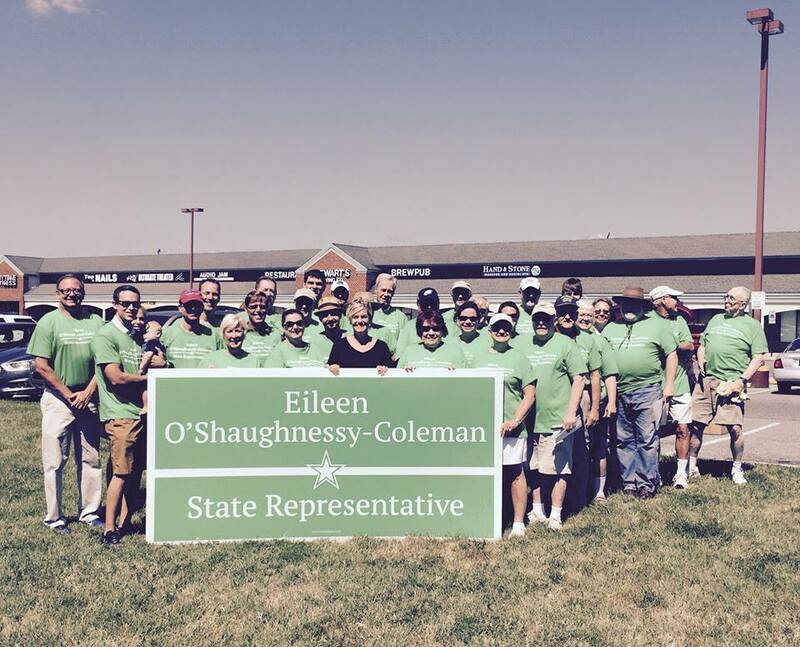 I hope that others will see fit to help Mrs. O’Shaughnessy- Coleman, either through volunteering, or donations, to ensure that the people get a representative with a volunteer heart, and not just another political wonk.